Major David, who landed on the evening of D-day, gave Maj. Madison Post, his maintenance officer, the job of supervising dewaterproofing, and set up the 45th Ordnance Battalion headquarters and the Ordnance depot in a group of buildings arranged in a quadrangle around a courtyard, a compound formerly used by an Italian Army elite corps. Parts were stored in the horse stalls of the stables. Profiting by his experience at Salerno, when he had to break crates open in order to find out what was in them, David had ordered an inventory in a waterproof envelope to be tacked onto each box of supplies; he carried with him a master packing list showing the part number, correct nomenclature, quantity, and box number of each item shipped. This master list was extremely useful in operating the depot. The Ordnance men slept, whenever they were able to sleep in the noise and frequent alerts, wherever they could. At first they tried abandoned houses and apartments, which offered protection from the cold, damp, sometimes snowy weather. 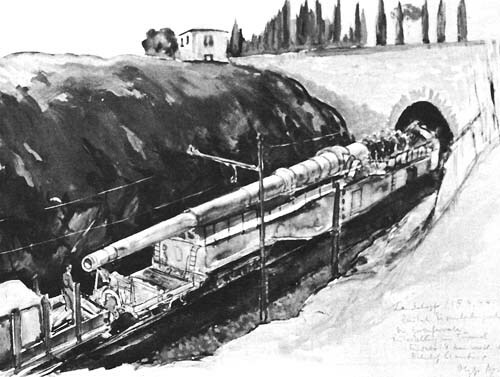 Every time a shell from a large long-range gun hit the Anzio beachhead, and they continued to hit regularly until the breakout in May, the troops blamed it on Anzio Annie, but the Germans had a formidable array of heavy artillery in addition to the railroad guns: 220-mm. 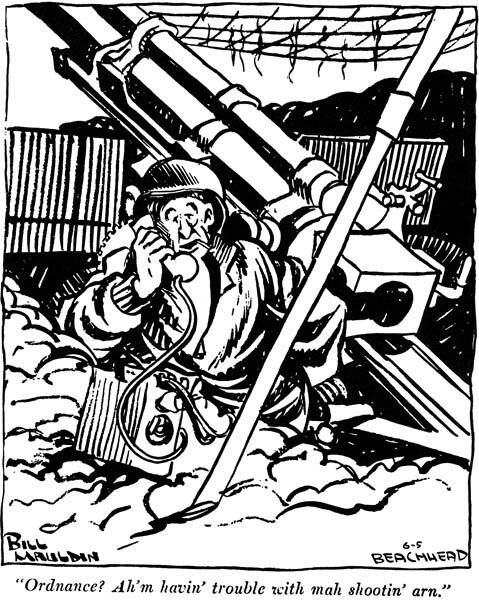 howitzers, 210-mm. howitzers, and 170-mm. guns. ANZIO ANNIE, from a German water color. 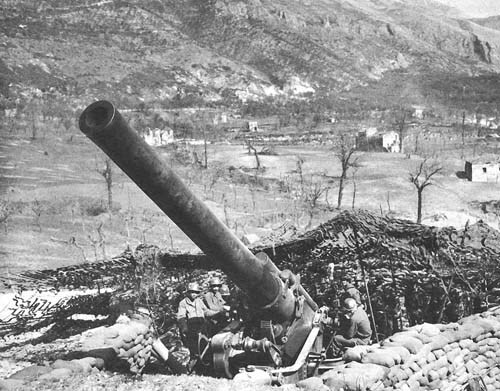 In such special situations the howitzers were invaluable, but the answer to the German 170-mm. gun was the 8-inch gun, which had a range of 35,000 yards, outranging the 170-mm. by about 5,000 yards.40 The Caliber Board Report of 1919 had recommended the development of a long-range 8-inch gun along with the long-range 240-mm. 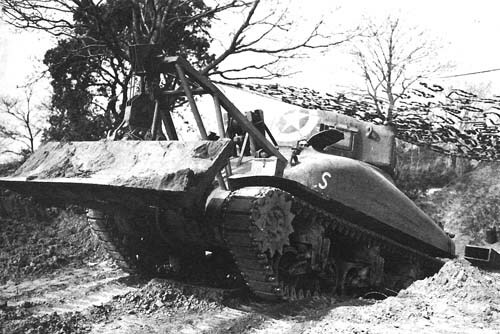 howitzer, and the Chief of Field Artillery had asked the Chief of Ordnance in January 1940 to procure pilot models of both, but the Army's interest in heavy artillery had lapsed in the early years of the war when the Germans were demonstrating so spectacularly the effectiveness of dive bombers and tanks. 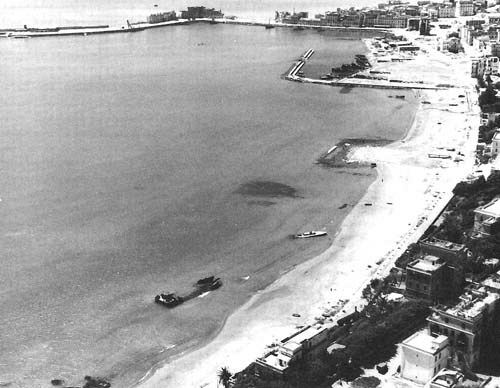 It revived after Tunisia, where the U.S. forces had come up against the 170-mm. gun for the first time. Returning from North Africa, General McNair on 15 May 1943 had stated, "Instead of artillery becoming an arm which is tending to fade out of the picture under the pressure of air power or tanks, it is there in the same strength and importance that it had in the [first] World War. "41 The 240- mm. howitzer, rather than the 8-inch gun, however, received most of the benefit from the renewed interest in heavy artillery. Syndicate, Inc. Copyright 1945 by Holt, Rinehart and Winston, Inc.
Reproduced by permission of Holt, Rinehart and Winston, Inc.